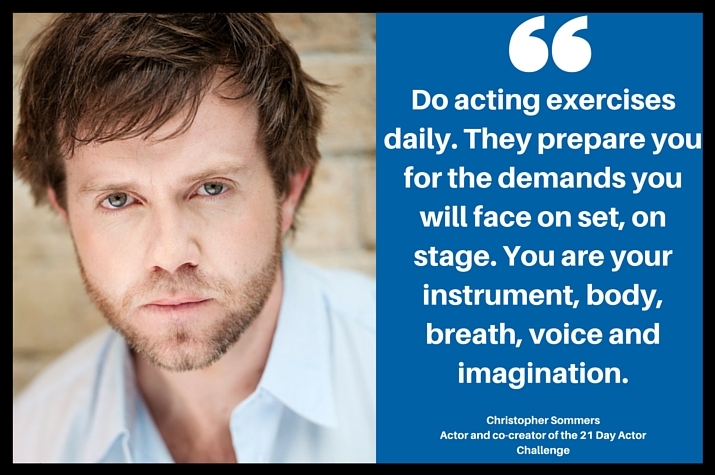 Actor and co-founder of the 21 Day Actor Challenge Christopher Sommers shares his tips for furthering your career as a performer. 1. Be Accountable. You can do something everyday to further your career as an actor. This will create a habit of proactivity and will empower you. 2. Cultivate a positive mindset. If you believe in yourself, it will be easier for others to believe in you too. Positive energy is attractive energy. 3. Do acting exercises daily, they prepare you for the demands you will face on set, on stage. You are your instrument, body, breath, voice and imagination. Start flexing your acting muscles. Feeding your artistic practice. Craft and technique is what an actor learns by being in constant discovery about themselves and others. This is necessary when you are becoming serious about your work. 4. Give yourself deadlines, start testing yourself, as they are important to an actor’s life in this industry. Self taping, auditions, monologue, scene or class work. When you get an opportunity you want to be ready, test yourself, make your artistry like an athlete preparing for a big event. 5. Your actor buddies and colleagues are your creative allies, work together, collaborate, bounce off each other. Actors need to engage with others. You are each others secret weapons. Lean on each other. 6. Place importance on goal setting. These are career goals outlining in detail what you want in the long term. Don’t be afraid to articulate your biggest goal, then you need to ask, “What actions do you need to take to implement them?” Daily actionable tasks are your stepping stones toward these goals. You can break these down into short term, mid term to long term goals. 7. Know what your “brand” is and where you fit in the market place, how are your tools (photographs, showreel) representing you? Learn what is special and unique about you. And how does that apply to your brand? 8. Tension and nerves can be an actor’s biggest obstacle: in auditions, rehearsal or performance. Learn how to relax and energise your body and mind to prepare yourself. 9. Don’t wait for anyone to give you success, but make your own through your goals and commitment to your craft. Treat yourself as a professional. Professionals work hard, they work with coaches, they take class, they work on themselves constantly and they find ways of doing this by seeking and attracting interesting work. 10. Be kind to yourself, embrace the journey, push yourself – who else will? Always be in discovery, and let your “inner child” bring the fun and playful aspect to your learning and work. Christopher Sommers has performed with the Queensland Theatre Company, Bell Shakespeare Company, and LA Boite. His film credits include Russell Crowe’s The Water Diviner and Festival hit The Horseman. His television credits include: Wanted (Seven Network), Reef Doctors, Terra Nova, Sea Patrol, The Starter Wife and Love Bytes. Christopher co-created The 21 Day Actor Challenge with Angela Olyslager and Tanya Schneider, an online acting training program that focuses on acting exercises actors need to do daily and how to be ready for being on set and self-taping.